Summary: In the masculine and highly charged world of Triple A junior hockey, any suspicion of a player being gay has a similar effect to lighting a stick of dynamite. A.J. grows up in this environment, along with a father who teaches through physical violence. His mainstay throughout his mother leaving and brutal fights with his father has been his best friend Tully and Tully’s loving family. When A.J. discovers Tully has been hiding a secret from him for years though, his whole world collapses and he is left to question his own identity and orientation. Review: After reading Bad Boy by Diana Wieler, I’m a bit confused myself, much like A.J., the main character. Although we’re talking about different types of confusion. I get the hockey part. Repeated exposure to hockey through books seems to have fostered interest in me, and when I found myself reading about Triple A hockey today, I wasn’t bored. And I think I actually grasped what was going on during the games. What I truly understood was the pressure playing sports puts on its players to fit into a box. In this story, being on a hockey team encourages hyper-masculine behaviour and homophobic attitudes. Fighting is somewhat frowned upon, but as A.J. observes, also encouraged. It’s not just about skill, it’s about being a physical threat on the ice. So when A.J. finds out his best friend and fellow team mate Tully is gay, he loses it a bit. He has been taught being gay means being effeminate and weak, and therefore unsuitable hockey player material. His surprise over his realization about Tully and confusion come out on the ice, as he turns it into senseless violence in an effort to regain his sense of control. But the major problem is not that Tully is gay, it is that A.J. seems to believe if his best friend is gay, he could be too. Once I realised that, I enjoyed the complex nature of the novel. A.J.’s overcompensating to prove to himself and others that he isn’t gay, so fervently that he gets suspended from hockey and tries to ‘prove’ himself with Tully’s sister Summer. What I didn’t get was Tully’s insistence that A.J. wasn’t gay. Tully says if A.J. was gay, he would have known it from childhood as Tully did, but I don’t agree. I wasn’t convinced by the end that A.J. just needed a good heterosexual relationship to clear his head, and I certainly wasn’t happy this relationship was going to be with Summer after the incident at his friend’s party. I liked the build up and the characters, but when it came to the end things fell apart for me. “It’s just an exhibition, for Pete’s sake, A.J. told himself. But he knew it wasn’t. Moose Jaw cared about Triple A. 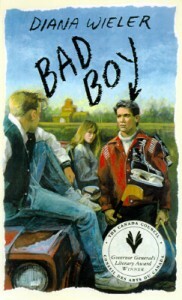 Bad Boy by Diana Wieler, is published by Groundwood Books, (1989).